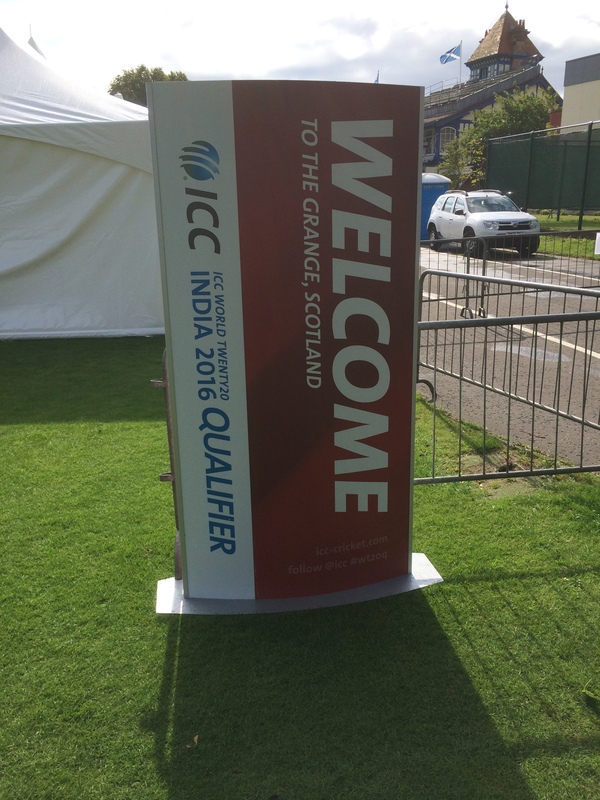 A weekend of international Twenty20 cricket was to be had in Edinburgh this weekend at the Grange club in Stockbridge. The qualifying tournament for next year’s T20 World Cup in India is being held in Scotland and Ireland over the next couple of weeks, with a round robin group being held in each country before the knockouts take place in Ireland. The Grange held three matches over the weekend, all of which were broadcast on Sky Sports. Having started playing cricket (fairly badly) for the mighty Tranent in recent weeks, I have a bit of a new-found appreciation for just how difficult cricket is to play well. As such, even in this range of second-tier international matches, it was obvious just how good the cricket on show was. Up first, as Saturday’s only game, was Scotland’s match against the Netherlands. 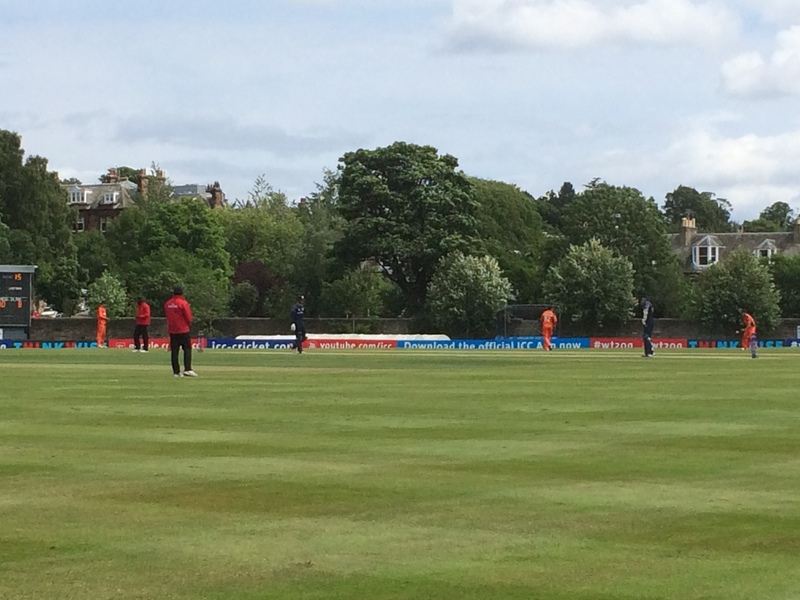 The Scots had started well, tonking Namibia on Thursday, while the Dutch had lost to Afghanistan on Friday. 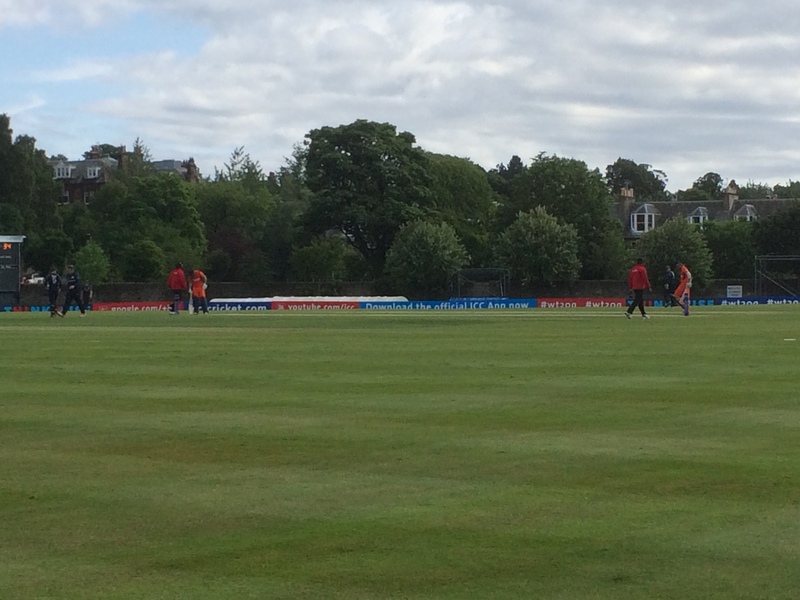 On a very pleasant morning in Edinburgh, the Netherlands won the toss and chose to bat. Wesley Barrasi’s quick 75 from 40 balls got the Dutch off to a flying start – him being dropped twice, including one absolute dolly, didn’t really help. Despite the excellent bowling of Ali Evans, who took 5-24 off his 4 overs, the Dutch pressed on the accelerator through their captain Peter Borren, scoring 57 from just 28 balls. 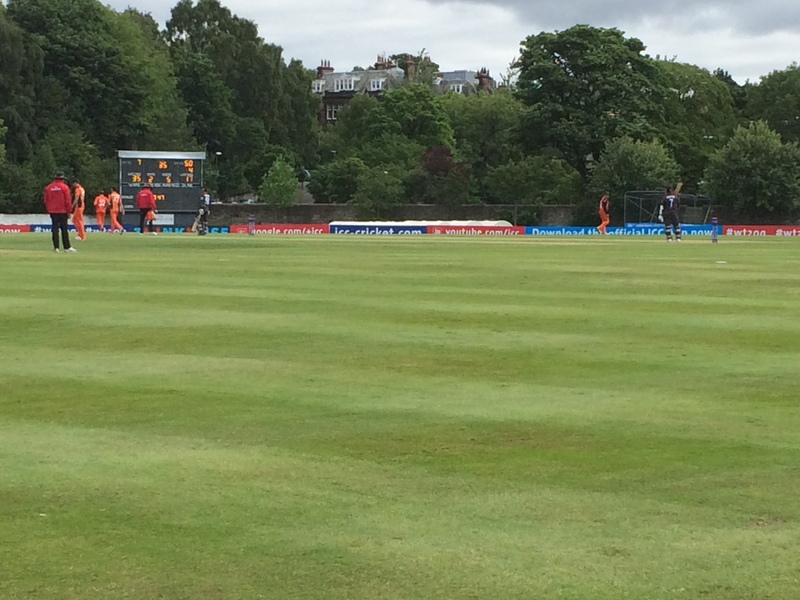 Those two scores, and some rather ropey bowling from Scotland’s 5 other bowlers, saw the Dutch post a strong total of 191-6 off their twenty overs. Scotland’s reply didn’t start too cleverly, as Kyle Coetzer firstly ran out the batsman at the non-striker’s end as his shot hit the stumps with the score on 2, and was then caught with the Scots only on 10. The wickets then fell regularly as the Scottish batsman kept trying to hit big, but failed to reach the boundary and invariably found a Dutch fielder. Undoubtedly the best catch was taken by Bukhari, who caught Berrington’s heave into the leg side having run round from square and dived forward to take the ball. Preston Mommsen provided some resistance, posting 68 not out to take the score from 79-7 to 159-7, but Scotland lost their last three wickets for nought, and ended losing by 32 runs. A well deserved win for the Dutch, who hit big and then placed their field absolutely impeccably to deny Scotland the win. Today’s cricketing feast saw two matches at the Grange club. The first was between conquerors of Scotland, the Netherlands, and losers to Scotland, the United Arab Emirates. The Dutch won the toss again and this time chose to field. Despite a fast start from the UAE, scoring more than 20 in the first 2 overs, they were soon pegged back. The spin of Roelof van der Merwe was particularly effective, the South African born bowler’s figures a miserly 2-10 off his four overs. Peter Borren was again at the fore taking a wonderful one-handed catch to dismiss Mohammad Naveed. 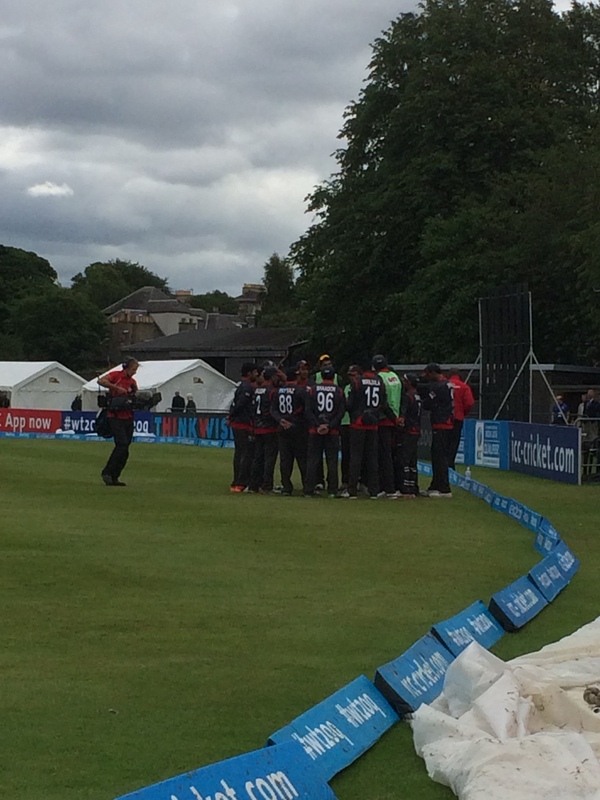 Off their twenty overs, the UAE could only muster a meagre 119-7 – just less than a run a ball. The Dutch response was reasonably boring, if utterly clinical. While they didn’t hit it out the park as they did against Scotland yesterday, there were good contributions from massive Dutch-Aussie Ben Cooper (50 from 38 balls) and a nice cameo yet again from captain Peter Borren. Borren finished proceedings with a six off the first ball of the eighteenth over, giving the Netherlands a very comfortable 7 wicket victory. And so to the main event. 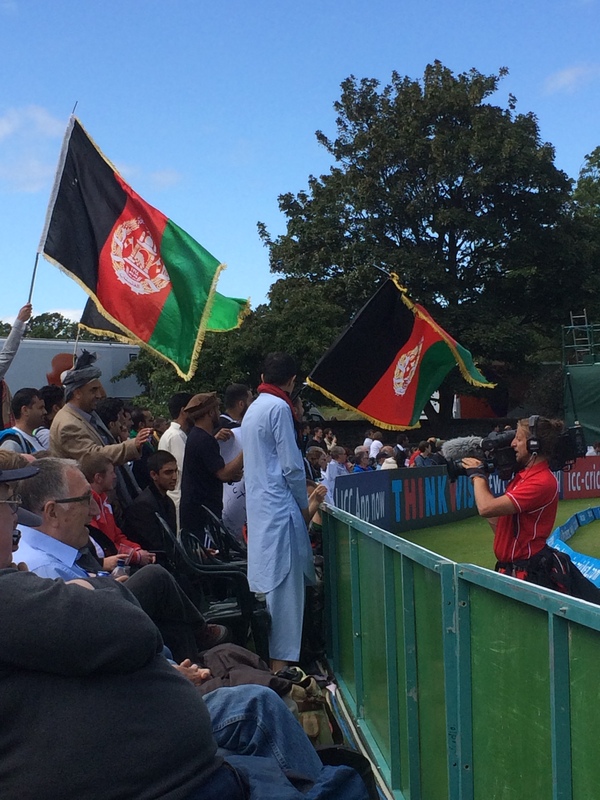 With a good sized Afghan crowd in, and far more Afghan flags on show than Saltires, the crowd were mostly rather pleased when Afghanistan won the toss and elected to bat. I spent some of the first over, particularly when Afghanistan were 2-1 after an early LBW decision went Michael Leask’s way, hoping that Afghanistan might not go as big as the Dutch did on Saturday. Unfortunately, I was very wrong. Wicket keeper Mohammad Shahzad set the tone for the Afghans, scoring a fantastic 75 off 36 balls, which included 7 huge sixes. There were runs and high strike rates all the way down the order for Afghanistan – Najibullah Zadran and Mohammad Nabi made telling contributions with both scoring over thirty from twenty or so balls. 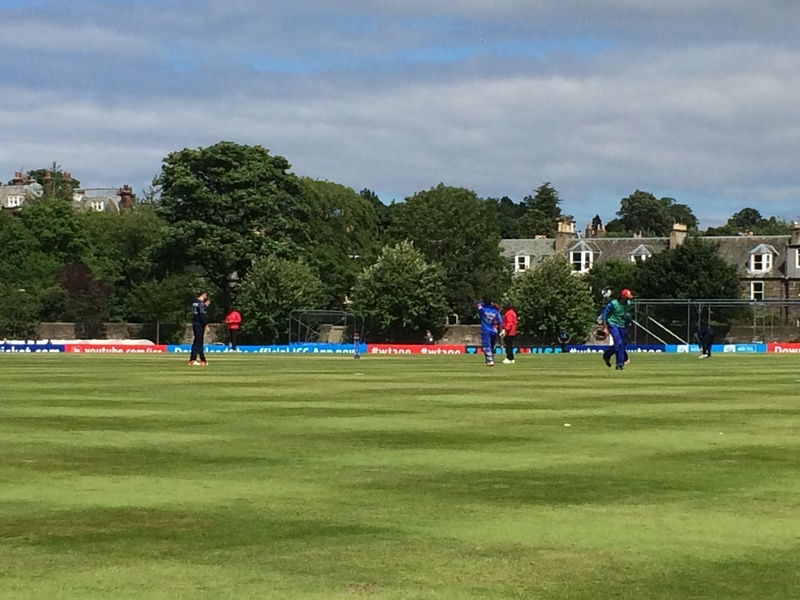 In the end, run outs were the best wicket taker for Scotland, as Afghanistan piled on the runs to finish 210-5 off their 20 overs. The highest T20 score for a nation quickly establishing itself as the second-best Associate side, and whose public clearly love their cricket and their cricket team. Scotland’s reply was, unfortunately, a little on the meek side again. Disciplined fielding and bowling from the Afghans particularly limited Scotland’s accumulation of runs in the early overs. Preston Mommsen again contributed, this time with 44 off 20 deliveries, and Matthew Cross provided another outlet scoring 37 off 22. Yet again, though, the wickets fell regularly and Scotland couldn’t get enough big hits in to put any kind pressure on the Afghan bowlers. 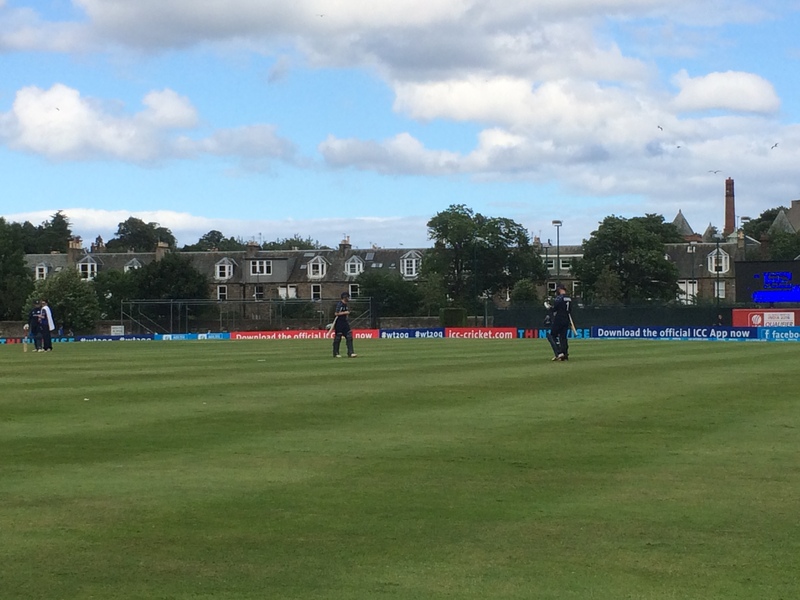 Scotland eventually fell short with 4 balls to go, the last three wickets again falling quickly with the Scots going from 171-7 to 173 all out. Mohammad Nabi and Hamid Hassan both bowled excellently, taking 3 wickets for 20-odd off their four overs. 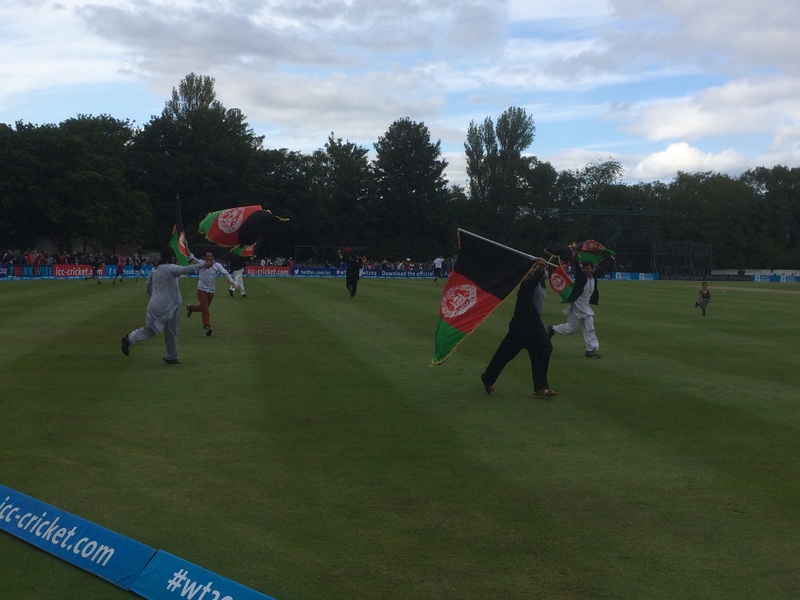 The better team clearly won the day, and it was frankly an absolute joy to watch the Afghan crowd celebrate with their team. A more friendly and knowledgable bunch of supporters, you would be hard-pressed to meet. 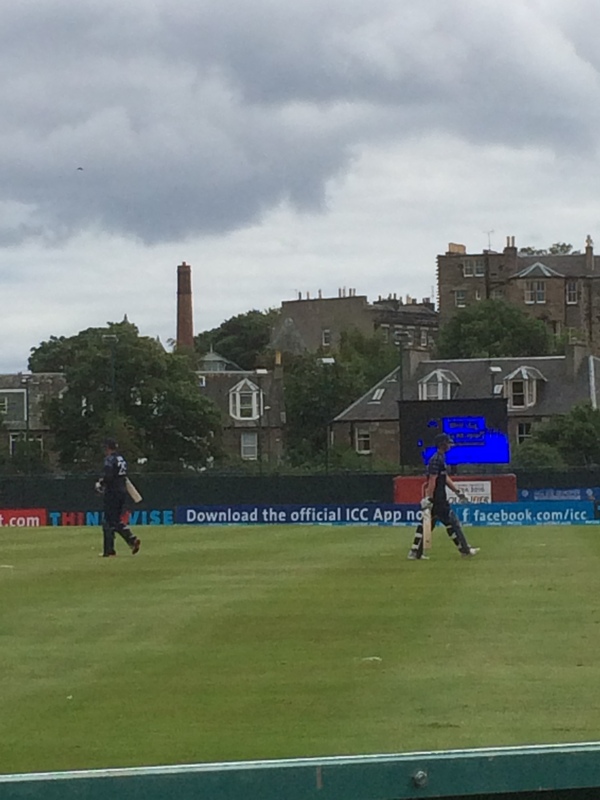 A great weekend of second-tier international cricket in Edinburgh, then – and once again Scotland showed that it is more than capable of putting on good quality international sporting events.